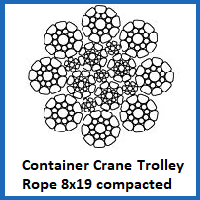 With 8×19 compacted container crane trolley rope, you can outfit out the trolley with a super tough stand-in when the original rope is no longer safe to use. Designed for strength thanks to its high fill factor and compaction processing, it should be a good choice. This rope shares the same benefits with all of our compacted wire rope products. That means it delivers a reduced diameter, with the various bundles of wires being pressed closer together at the end of manufacturing. As well as making the 8×19 construction rope sturdier, it also means that it is smoother and less likely to suffer abrasions, or succumb to crushing during use. Also available with a plastic core for added fatigue resistance, this particular wire rope is a key part of our container crane line up. There is no need to limit yourself when shopping with us. You can find ship crane ropes, steel mill ropes and many other specialised wire rope products right here. We made each rope to the specifications you request and adhere to the highest standards across all of the options we offer to our valued customers. Ordering from Rope Services Direct could not be simpler. Just call 01384 78004 to get assistance from our expert team, or email us about any of the crane rope options we offer. Remember we also manufacture webbing products including a wide range of lifting slings and Cargo lashings. 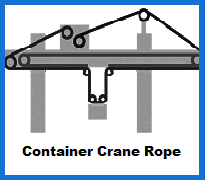 8x19 Compacted Container Crane Trolley Rope Overall rating: 5 out of 5 based on 6 reviews.